All material on Svenska Spårvägssällskapet’s Web site is protected by Swedish and international copyright law. All forms of copying and reproduction are prohibited. Violations will be prosecuted. Article authors, photographers, and other contributors retain the rights to their own work, but have given Svenska Spårvägssällskapet the right to use the material on Svenska Spårvägssällskapet’s Web site. Redistribution of content on Svenska Spårvägssällskapet’s Web site, including text, images and concepts, is prohibited. Anyone who wishes to use material from this Web site shall contact Svenska Spårvägssällskapet via the Infomaster, or shall contact the individual contributor. 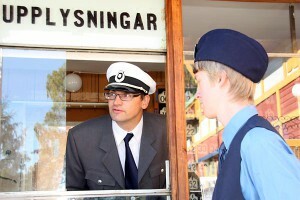 Djurgårdslinjen is a registered trademark and designates the tram service with vintage trams that Stockholms Spårvägar AB operates on the route between Norrmalmstorg and Djurgården. On 25 July 2003, a new law governing electronic communication came into effect. A portion of this law pertains to cookies on Web pages. A cookie is a text file that is stored on the visitor’s computer. Cookies are used to assist with many advanced Web functions. The Swedish Parliament has stated that cookies are an invasion of privacy, and that any Web page that uses them must therefore, by law, inform the visitor of this. On this site, cookies are used for several functions, such as logging in to protected pages, user verification in the Forum, and language control. If you want to avoid cookies, you can avoid using these functions and set your Web browser to not accept cookies, but then you may find that the site does not work as intended. We therefore recommend that you allow cookies – you can surf on Spårvägssällskapet’s site with peace of mind. As an association, we register information about each member’s name, address, telephone number, E-mail address, elected offices and similar information required for our own administration. We also track which members are active in our operations and have particular qualifications under law and regulations, such as for safety-related jobs. Personal ID numbers are registered where there is a clear need, e.g. to be able to reliably identify members with particular qualifications, handle insurance coverage, etc. We do not use personal ID numbers as membership numbers. The society’s board is responsible for ensuring that members’ information is handled in accordance with the Personal Data Act. Svenska Spårvägssällskapet uses the information in its membership rolls only for internal purposes. We do not sell data from our membership rolls to anyone else. forum. Copy the following addresses into your RSS reader. We do not guarantee the correctness of any information on this site. We reserve the right to modify or update the contents of this site without notice or warning. We accept no responsibility for the sites that link to us or that we link to. We have no control over, or responsibility for, sites that you come into contact with via this site. This site is hosted at the Web hotel FS Data. It uses WordPress and homegrown software and databases on stable Linux servers. This site was produced by Pantograph.